Cx5 and Cx5s — Adam Beane Industries, Inc.
Cx5 and Cx5s are premium sculpting materials designed to be used in place of sculpting clays, finish waxes, and prototyping plastics. They handle like clay when warm, finish like wax, and can be as hard as plastic when cool. Cx5s is the softer version, and by mixing the two you can create a hardness level that's appropriate for your sculpting style. They are the ideal material for every stage of your project, from roughing out and building up, to adding fine details, machined features and a high polish. Cx5 is a temperature sensitive material that behaves like clay, wax, plastic, and even paint at different temperatures. Cx5s is the softer version of Cx5. Because either can be used for every stage of sculpting they eliminate the need to begin your sculpture in a clay, create a waste mold, and pour a wax for final detailing. First, rough out your sculpture in warm Cx5 or Cx5s without the need for an armature. Then, fine tune the details using both traditional and hot tools. When your sculpture has cooled completely, sand or polish the surface for a perfect finish. Any sculpture can be cut apart and molded using traditional mold materials, and then melted down and reused for your next project. Cx5 and Cx5s are proudly manufactured in the United States by Adam Beane Industries and are non-toxic and all natural. Melts to the consistency of house paint - brush onto foam, plastic, existing clay sculptures, etc. For sculpting, heat Cx5 or Cx5s in an electric skillet, slow cooker, double boiler, under a lamp or in a microwave. Both Cx5 and Cx5s are warm and ready to model at 125°F. Sculpt by creating a base shape in either and adding warm material onto it. For best cohesion, heat sections of your sculpture over an alcohol lamp (using denatured alcohol only) before adding more warm Cx5 or Cx5s. Use traditional loop tools, rakes, etc. with metal tips, and metal sculpting tools heated over an alcohol lamp to define large forms. Heat 3M Softback Sanding sponges over an alcohol lamp (never allow them to smoke) and use them to smooth the contours of the piece. Use a waxer with different tips for moving large amounts of material, and for doing detail work. For machining, cast Cx5 into base forms (blocks, rods, and sheets) and allow it to cool. Machine at slow speed or slow feed, or with water as a cutting fluid. To finish your piece, file, wet sand, solvent sand, or polish it. Mold as a single piece, or cut your sculpture apart for molding in sections. Cast your sculpture in a final material, like plastic, and re-use the Cx5 for another project, or save your original Cx5 sculpture - it will has an indefinite shelf life, as opposed to the limited shelf lives of rubber molds. Check out the tools we recommend for working in Cx5. 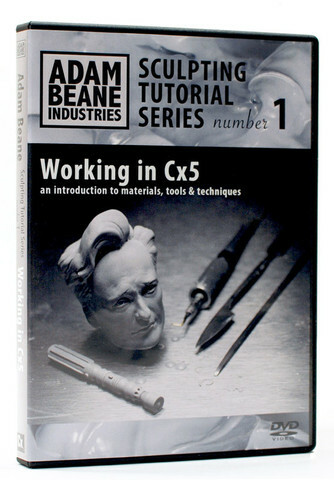 For detailed instruction on these techniques and others, consider the first video in the Sculpting Tutorial Series - Working in Cx5: an introduction to materials, tools & techniques.